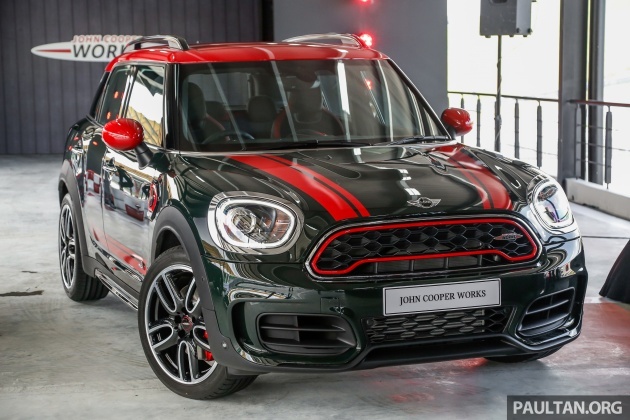 Those of you who want a MINI driving experience that’s sportier than even the Cooper S variants provide can now step this way, as BMW Malaysia has introduced the latest John Cooper Works models in Malaysia. The first one we’re looking at is the MINI John Cooper Works Countryman that serves as an extension to the standard variants launched earlier in the year. 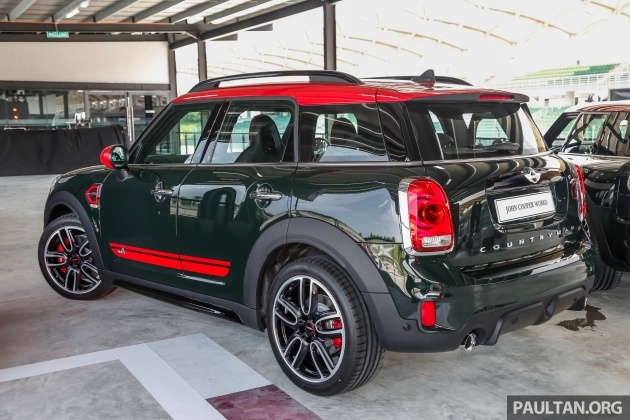 It’s certainly not cheap, retailing at RM348,888 on-the-road without insurance, making it a whopping RM79,000 more expensive than the Cooper S Countryman. Included is a four-year, unlimited-mileage warranty and a four-year/60,000 km free service package. So what do you get for your money? Well, more power for one – 231 hp from 5,000 to 6,000 rpm and 350 Nm of torque between 1,450 to 4,500 rpm from a 2.0 litre turbo four-cylinder engine, representing gains of 39 hp and 70 Nm over the Cooper S. Mated to it is eight-speed sport automatic gearbox and All4 all-wheel drive, enabling the SUV to go from zero to 100 km/h in 6.5 seconds before reaching a top speed of 234 km/h. Keeping all that performance on the road is a sports suspension set up with adaptive dampers, controlled by MINI Driving Modes with Sport, Mid and Green settings. Also fitted are Brembo brakes with four-piston callipers that are painted red and feature the JCW logo. To highlight the extra performance, the JCW comes fully kitted up on the outside, with more aggressive front and rear bumpers, side skirts, a large tailgate spoiler and a JCW exhaust system with twin exits, along with Chilli Red bonnet and side stripes, roof and mirror caps that add to the racy look. The red highlights also extend to the grille and side scuttles, and the car rides on massive 19-inch Course Spoke alloy wheels. 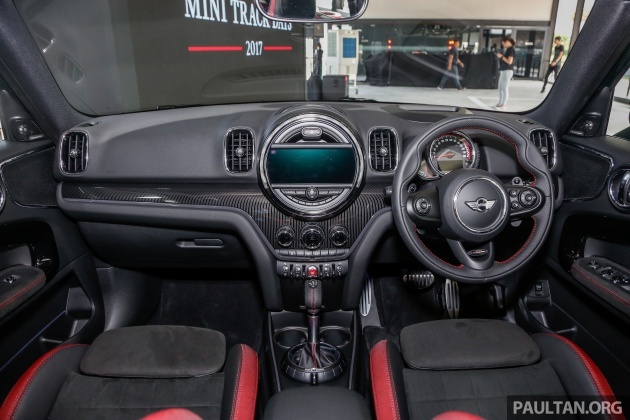 Inside, the JCW features sports seats as well as a JCW multifunction steering wheel with paddle shifters, a sportier instrument cluster, JCW-badged side sills and stainless steel pedals. Local cars are equipped with a chrome line trim package, anthracite headlining and illuminated MINI Yours Piano Black trim. Standard equipment includes LED headlights with LED daytime running lights and cornering lights, puddle lamps with the MINI logo, Comfort Access keyless entry, auto lights and wipers, an auto-dimming rear-view mirror, dual-zone auto climate control, cruise control and a powered tailgate with handsfree opening. The kit list also includes the full Professional navigation system with an 8.8-inch touchscreen and an iDrive-style controller with touch input, plus a 12-speaker Harman Kardon sound system, a head-up display and a reverse camera. The car also comes with MINI Connected smartphone connectivity as well as MINI Find Mate, which consists of Bluetooth tags that can be attached to your belongings, enabling them to be tracked. Mercedes A45 AMG, 381hp. A humble hot hatch with incredible pace. Buy the smallest Mesidis, pipu will still relate u to S keras. Buy a mini, pipu will relate u to Mr Bean. And also buy Mesidis, pipu will sure relate u to Ahpek. our currency its getting pity….. Despite the image given, this mini is not ur Mr Bean mini. Of cuz its exp. Free falling our currency good for exports & tourism..
G30 530i demo units from 360k up will be where I would put my cash for. Finally the AWD is here, but still stingy with panoramic sunroof at 348 888 ; option for bright interior. its 100k cheaper than evoque.